was named the MVP at the Perfect Game Showdown. The Titans defeated Providence Christian (Fla.) 11-9 on Saturday to win their division after defeating Georgia powers Brookwood, Buford and Parkview to advance to the title game. Junior Jake Smith was named the Most Valuable Player. With four weeks completed, only six remaining schools areundefeated. In Class 6A, a pair of south Georgia schools in Valdosta and Glynn Academy are unbeaten. Towers is 6-0 in Class 3A, while a trio of Class 1A private schools – Mount Paran Christian, Mount Vernon Presbyterian and Calvary Day – are still unbeaten. Newnan’s Jaxon O’Neal struck out 12 batters in five innings in a 5-1 region victory over Westlake on March 6. In a 3-2 victory over Starr’s Mill on March 3, Lucas Mapp went 4-for-4 at the plate. He leads the Cougars, who are 10-4 on the season, on offense. North Forsyth continues to play well and went 2-0 last week with impressive wins over Archer and a 3-2 victory over previously unbeaten Woodstock. In a 6-2 win over Archer, Brody Westbrooks allowed just one run on four hits in six innings. He struck out five before yielding to reliever Caelan Thomas who struck out all three batters he faced in the seventh. In the victory over Woodstock, Antony DiMola allowed just one earned run on two hits in six innings to earn the victory, while Tucker Daniel worked a scoreless seventh and struck out two for the save. Parkview went 4-1 on the week, including a 3-1 finish at the prestigious Perfect Game Showdown in Emerson. The Panthers defeated North Broward Prep, Cullman (Ala.) and Cartersville in the tournament. Parkview was sparked offensively by Michael Bryant (4-for-12, four runs scored), Isaiah Byars (4-for-13, two runs scored) and Logan Cerny (4-for-13, four runs scored, RBI). They also got strong pitching from Braden Hays (5 innings, no runs, three hits) who struck out 12 in a 10-0 shutout of North Broward Prep. Robert Bennett struck out six and allowed an unearned run on five hits in a 2-1 victory over Cullman. But Xander Stephens had perhaps the most impressive week, getting victories over Grayson and Cartersville. Stephens tallied 11 innings during the week, allowing just one run on seven hits and striking out a combined 13. South Gwinnett went 3-0 from Feb. 26 – March 3 with victories over Social Circle, Norcross and Northview. The Comets were led by Cabera Weaver who went 9-for-11 at the plate with three doubles, a triple, six RBIs and three stolen bases. He also scored seven runs. Marc Davis went 7-for-12 with two doubles, four RBIs and scored two runs during that span. The Comets also got solid pitching outings from Davis (5 IP with seven strikeouts) and Jackson McCarthy (5 1/3 IP, 1 hit and four strikeouts). Coffee's Nolan Wood went 2-for-4 with four RBIs in a nine-inning victory over Cook on March 2. Wood’s three-run walkoff homer helped the Trojans to an 8-5 victory. Justin Tarver pitched three scoreless innings in the game to earn his first varsity victory. Jack Oesterle continues to shine for Discovery. In a 5-1 loss to Mountain View on March 7, Oesterle pitched a complete game, struck out six and allowed just two earned runs. His season earned run average is 2.83. Top-ranked Loganville went 3-1 in the Perfect Game Showdown. The Red Devils’ only loss was a 2-0 setback to Providence (Fla.). In the four games in the tournament, Loganville allowed just five runs while scoring 34. The Red Devils were led on the mound by Seth Clark, Connor Bruce and Bay Witcher. Offensively, Dylan Strickland, Justin Moss, Ian King and Tanner Green led the way. Loganville defeated Troup (11-0), Grayson (11-0) and Cullman (Ala.) (12-3). In a 16-6 victory over Pepperell on March 3, Central-Carrollton pitcher Dylan High struck out 10 batters in 5 1/3 innings. He also went 2-for-3 on offense with three RBIs in the game. Stephens County is off to its best start since the Indians played for the state championship in 2008. A big reason is because of junior pitcher Davis Swenson. In the past week and a half, Swenson has two starts and one relief appearance. He is 2-0 with a save in that span. In 13 2/3 innings, he struck out 22 and walked two with a perfect earned run average. On the season, Swenson is 4-0 with a save and 37 strikeouts in 24 innings. His earned run average is 1.45. Westover lost a trio of games this past week but a pair of players still had solid performances. Outfielder La’Borris Buchanan batted .400 for the week with a double, RBI and three stolen bases. Senior pitcher Davis Spalinger struck out 15 in eight innings of work on the mound. He allowed no earned runs and just one walk. Greater Atlanta Christian dropped two of three to East Hall last week to open Region 7-3A play. However, a trio of Spartan players still put together solid numbers. Senior Carson Taylor went 5-for-10 on offense with a double and scored three runs. He has signed with Virginia Tech. Junior Shane Lussier went 5-for-11 at the plate with two doubles, a triple, an RBI and scored three runs. Sophomore left-hander Bryceton Payne earned the victory in an 8-2 win on March 9. He allowed two runs (one earned) on three hits and struck out eight. Coach Tedd Sims has East Jackson off to its best start in school history at 8-5. A key reason is because of sophomore Cole Sealey and senior pitcher Luke Hadden. Sealey was hitting .520 with a homer, two triples, seven doubles and 10 RBIs as of March 7. Sealey had thrown 10 innings and had a 0.00 earned run average. Hadden is 3-1 on the year with 19 innings and 28 strikeouts. He threw a no-hitter on March 7 in an 11-1 victory over Johnson-Gainesville. Ringgold went 2-1 from Feb. 26-March 3 with a pair of victories over Northwest Whitfield and a loss to Heritage-Catoosa. In those three games, the Tigers went wild offensively. Daulton Schley went 5-for-10 with four doubles and a homer, Andre Tarver went 5-for-10 with seven RBIs and a grand slam, Holden Tucker went 5-for-11 and scored five runs, Nathan Camp went 4-for-10 and scored five runs, while Gavin Hollis went 3-for-10. In five games last week, Chattooga’s Caleb Veitch finished with a .625 average and a .750 on-base percentage. He had two doubles, a homer and seven RBIs. In the same span, Devin Price hit .421 with a .450 on-base percentage. He added two doubles and a triple and finished with six RBIs and three stolen bases while scoring seven runs. 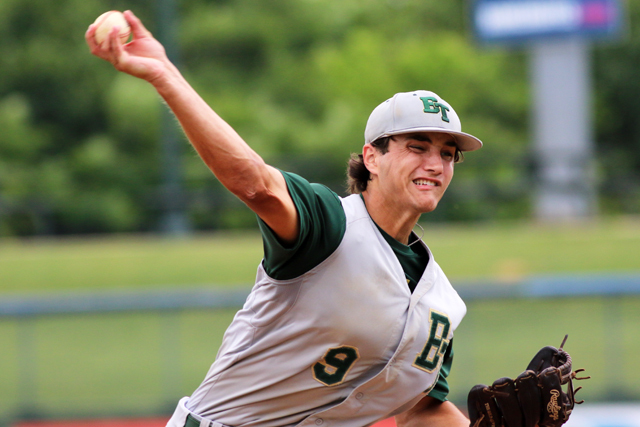 Early County got a pair of strong pitching performances last week. Max Sealey struck out 14 and no-hit Northside Methodist in a 4-3 victory on March 5. Then the Bobcats defeated Brooks County 10-0 in the Region 1-2A opener on March 6 as Mason Johns struck out 12 Brooks County batters. Rockmart’s Dylan Bailey went wild at the plate in the Yellow Jackets’ last two victories over Gordon Central (March 9) and then No. 9 Berrien (March 10). Bailey went 4-for-6 at the plate with a double, a homer and seven RBIs. His two-run homer was a walkoff to help Rockmart break a 2-2 tie and defeat Berrien on Saturday. Clinch County beat Brooks County and McIntosh County Academy last week but lost a tough 2-1 Region 2-1A decision to Telfair County. Junior left-hander Warren Stovall tossed a complete-game no-hitter and struck out 11 against Telfair. Senior left-hander Michael Gilbreth tossed a complete-game shutout allowing just three hits and striking out five in a 2-0 victory over McIntosh County Academy. Meanwhile, junior Duncan Lutz went 8-for-12 at the plate with a pair of doubles and three RBIs in the three games. Pelham catcher Doug Curles had a big night as the Hornets split a pair of games with Miller County on March 5. Curles combined to go 6-for-6 with two doubles and a pair of RBIs. He also got defensive, throwing out a runner attempting to steal. Curles leads the Hornets with a .533 avg. (16-for-33). Savannah Christian earned a pair of Region 3-1A victories this week, defeating Savannah Country Day and Portal to improve to 10-2. Part of the Raiders’ success is because of sophomore Kyle Hilton. He tossed six innings this week with seven strikeouts to improve his pitching record to 3-0 and 15-0 in his prep career. He didn’t do bad at the plate either, going 3-for-5 with a homer, double and three RBIs. Saint Francis junior Kyle Bork had a strong week, batting .700 (7-for-10) with five RBIs. At Cool Ray Field on March 8, Bork delivered a single in extra innings to score Brooks Mitchell and give the Knights an 8-7 walk-off victory over Athens Academy.